Operating in the Saronic Gulf, Hellenic Seaways has placed their fleet of 3 Flying Dolphin ferries on these routes to offer passengers a unique high speed service. 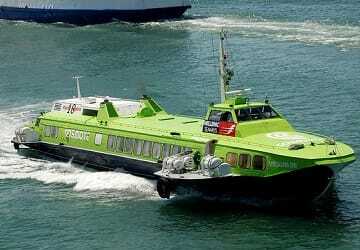 All three ferries are hydrofoil/passenger only. Sister ships Flying Dolphin 17 and 18 were both built in Russia in the early 1980’s and have a passenger capacity of 141 while the newer Flying Dolphin 29 was built in the nineties. All 3 Flying Dolphins can travel at a speed of up to 33.5 knots. Please Note: Whilst we have taken great care in making our Flying Dolphins guide as accurate as possible, onboard facilities, services and entertainment may vary depending on the date and time of year that you travel, facilities mentioned may change without notification and ferry companies reserve the right to operate vessels other than those mentioned at time of booking without prior notification. Simple booking and punctual ships. The jorney was short but everything went as usual. Highly recommend. Really quick service from Pireaus to Poros. Very good experience. Very simple. "A PLEASANT TRIP TO POROS"
Excellent experience. Picking up our tickets took less than 5 minutes. Boarding was smooth and on time. The journey over was quick and we arrived on time. Would use again. "Enjoyable experience, no real problems." Booking was easy from UK. Trip was fine. Alteration to return day caused by May 1 strike was accommodated well. No problems, we enjoyed it. Found the "Flying Dolphins" Hydrofoil service quick and efficient. The crew were most polite and very helpful. Very efficient organised service to the islands. Staff were friendly and it was a pleasant journey. I have already recommended this service to a friend who will be travelling there shortly.